The Australian Concert Tour is over now, but the Memories and Friendships will live on forever ... 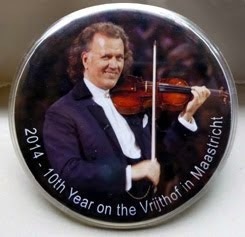 Safe travels home to André, the JSO and all the Fans who traveled Downunder for these special last few weeks! He Came ~ He Saw ~ He Conquered Again! HE came, he saw, he conquered again. 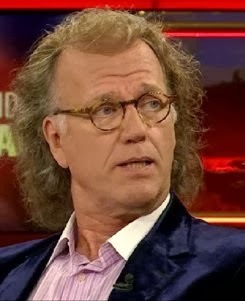 Flying Dutchman André Rieu is an entertainment emperor. No palaces, ice skating, horse drawn carriages or Trevi Fountains this time, just wonderful music and lots of it. 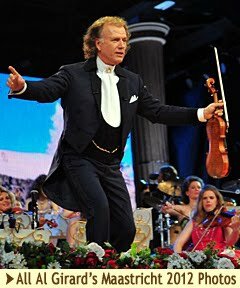 Even without the full spectacle, a night out with Rieu is still something to celebrate and a great advert for classical music. 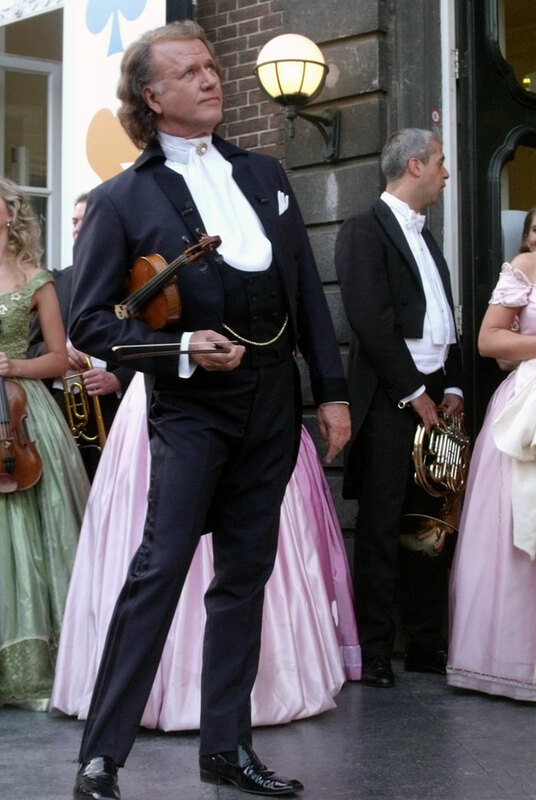 The costumes, the quality musicians, the pomp and refusal to stand on ceremony, make his concerts a celebration. And make no mistake. 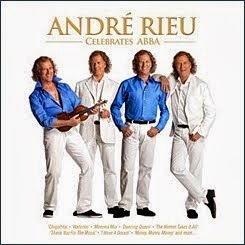 While he is happy to feature his stellar supporting cast, it is André's show. 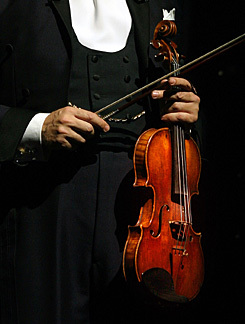 Every note, every gag, every nuance and invitation to waltz comes directly from the consummate showman. 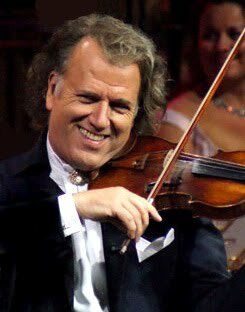 Rieu leads the orchestra with his accomplished violin skills and the Platinum Tenors Thomas Gruel, Bela Mavrak and Australia's own Gary Bennett were back to make a marvellous vocal contribution to the evening. 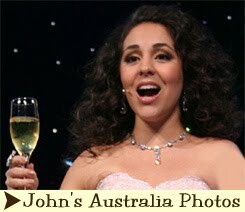 Brazilian beauty Carmen Monarcha was joined by the Australian Girls Choir in several dazzling numbers. But it was Australian soprano Mirusia Louwerse who stole the show with a rendition of Memory which put Elaine Paige's under whelming Sunday night effort at Adelaide Festival Theatre to shame. 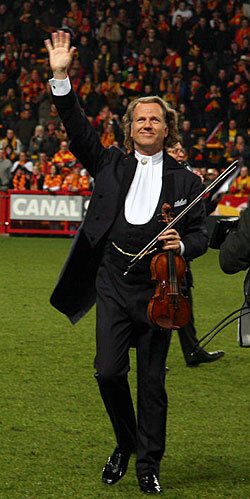 It was nice to see Rieu also pay a touching tribute to another global icon, Michael Jackson. 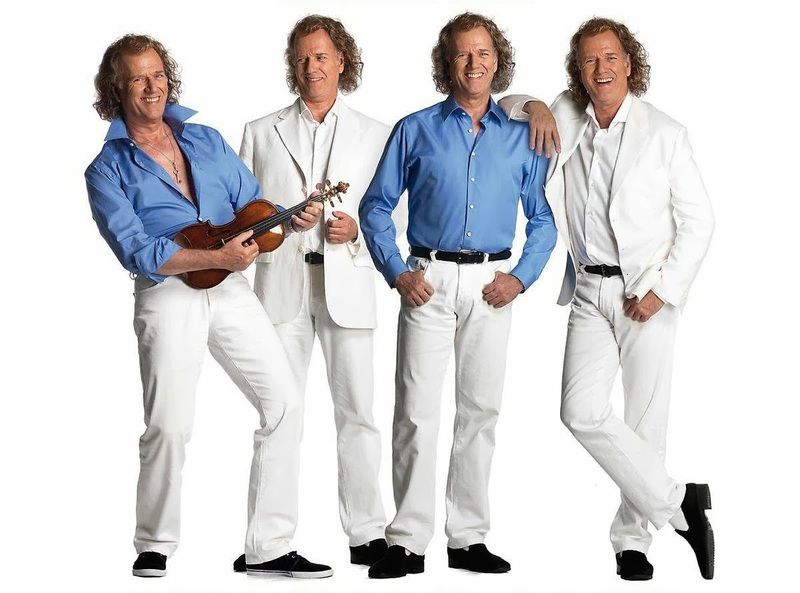 The endless finale saw Rieu get the crowd singing along as he rolled out Aussie favourites and invited them all back to his concert next October. 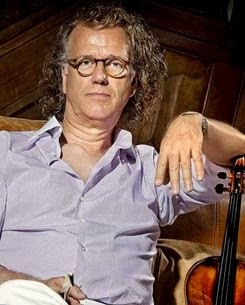 DUTCH violin maestro Andre Rieu has revealed he had hoped to team up with Michael Jackson for a musical performance, before the singer's shocking death in June. 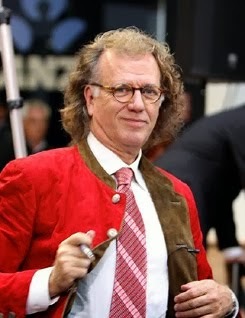 Rieu, who made a surprise appearance at the premiere of Jackson's "This Is It" at Crown on Wednesday night in Melbourne, said he had met Jackson while performing in Monaco and had been impressed by the singer. 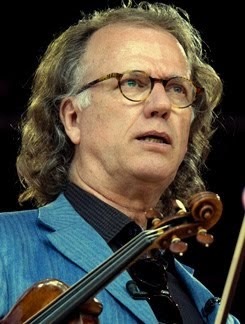 "He was a great man and a great artist," Rieu said. 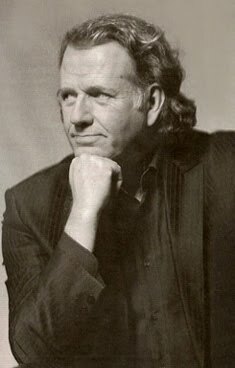 "I would have loved to have made music together with him." 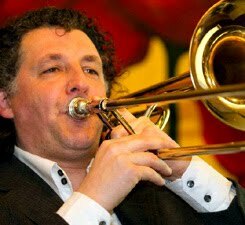 Rieu said he had been performing one of his trademark waltzes at the World Music Awards when the King of Pop caught his attention. 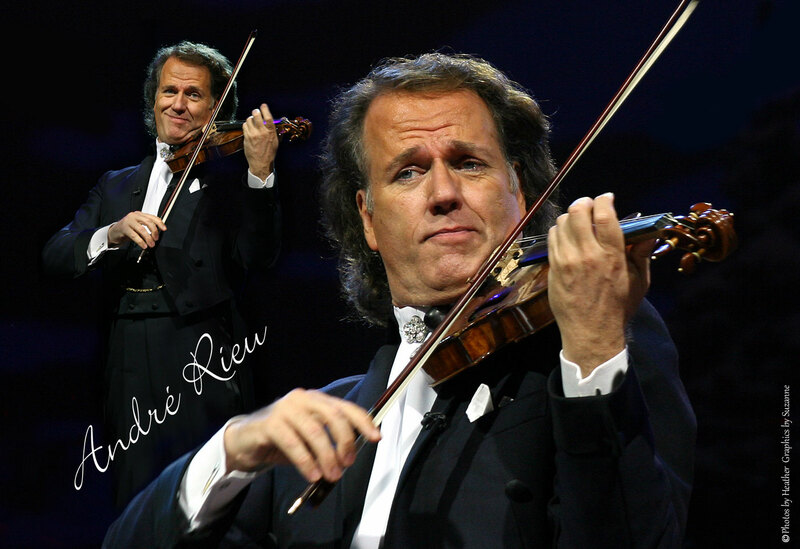 "He was sitting in the front row and he really enjoyed it," Rieu said. 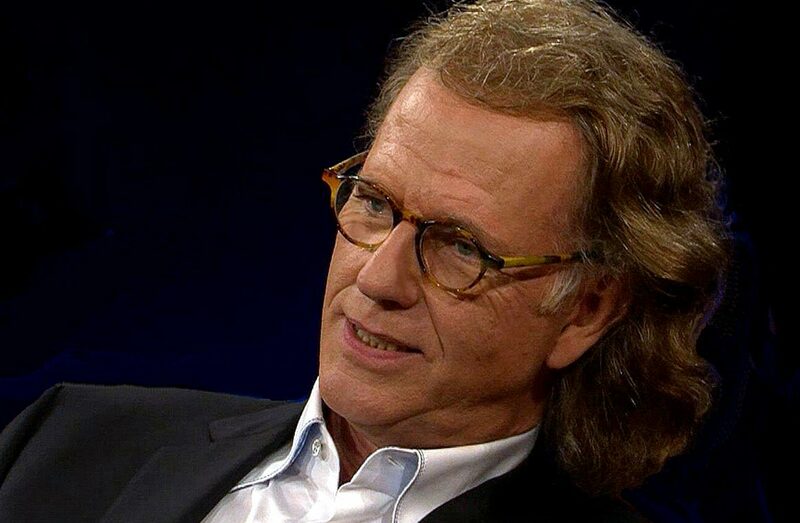 "We have lost a fantastic man." 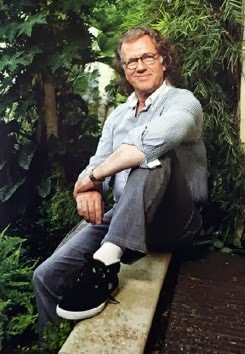 And Rieu, who performed the first of his four Melbourne concerts at Rod Laver Arena last night, said he had added two Jackson songs, 'Ben' and 'Earth Song' to his repertoire to honour the late singer. 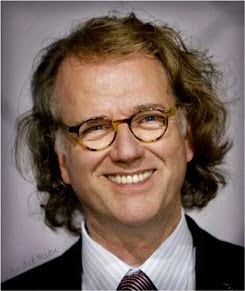 "He is fantastic, he is a genius . . . 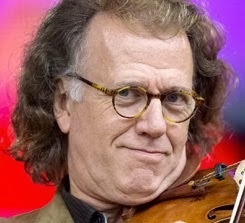 I play two pieces to honour him," he said. 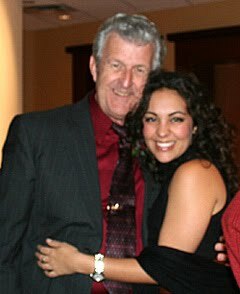 Jann always sends me these little "Cell Phone Photos" and I thought I'd put this one on here ... She just sent this one to me of them all at dinner before tonight's concert. Murray is not in it because he took the picture. Isn't modern technology great! Here is Beate from Germany, John and Bobbie from California and Jann from Australia, all having dinner before André's Concert in Melbourne and we're looking at them while they're eating!! 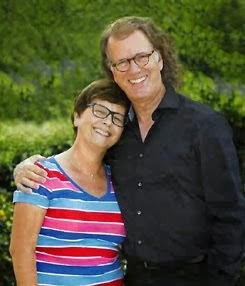 During the past week, I had the opportunity to visit with Suzan Erens and see/hear her sing at the Kulturverkstedet on Sjogata Street in the historic section of Mosjoen, Norway. 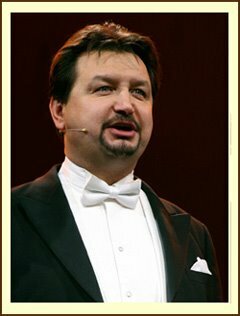 This was advertised as a "Luncheon with Opera" or perhaps an "opera with your coffee". Walking down Sjogata Street, I found my way into the Kulturverkstedet or Cultural Workshop. 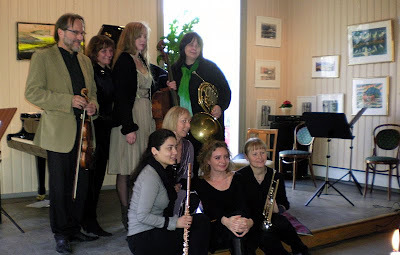 Once inside, I located a program "Operalugsj med Suzan Erens" and began reviewing the highlights. As I was early, I could hear Suzan still rehearsing and running checks, etc. in the next room. 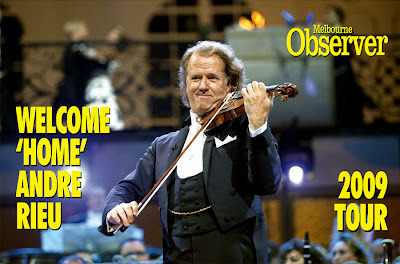 Review by Terry Carroll Melbourne Herald Sun ~ IT was a swooning love in when André Rieu and his 50 strong Johann Strauss Orchestra played at Rod Laver Arena last night.Though the violin maestro was here less than a year ago, the faithful thought it was too long a wait and gave him a rapturous welcome in the anticipation of his Classical, Operetta, Movie and March favorites. 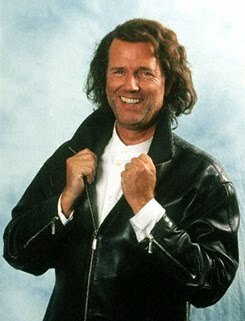 And he didn't disappoint his mass of fans, mostly baby boomers. It was a more modest affair compared with the huge production at the Etihad Stadium (Telstradome) in November. 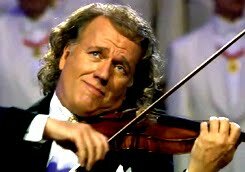 It was also a different program, but with all the Rieu stars. 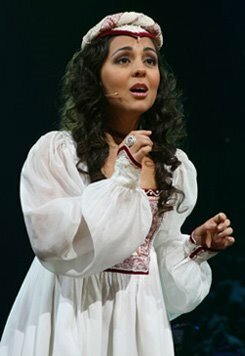 Brazilian soprano, Carmen Monarcha passionately sang Michael Jackson's "Earth Song" with a choir of Melbourne kids. 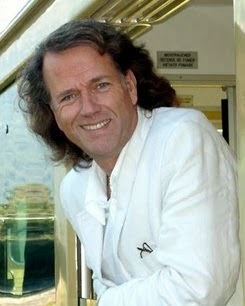 The Platin Tenors, including Tasmanian Gary Bennett, belted out "Torna a Surriento". While Mirusia Louwerse brought the house down with her version of, "I Could Have Danced All Night". The Waltzes are the big hits though, with the "Blue Danube" swaying the crowd. 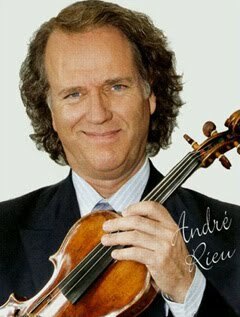 Rieu appears again tonight. 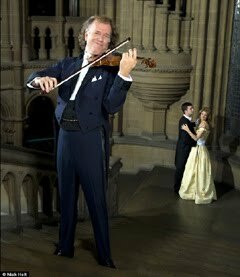 ANDRÉ Rieu the flying Dutch musical sensation with his $11 million Stradivarius flew into Melbourne yesterday and proclaimed the Blue Danube Waltz was the secret to longevity. 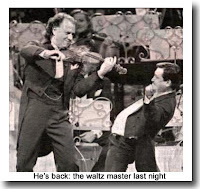 "The most important thing in life is your health, here in your head," he said, "and the waltz is my secret." 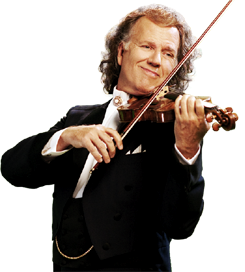 Accompanied by 110 musicians, singers and crew, Rieu will give the first of four Melbourne concerts tonight at Rod Laver Arena. 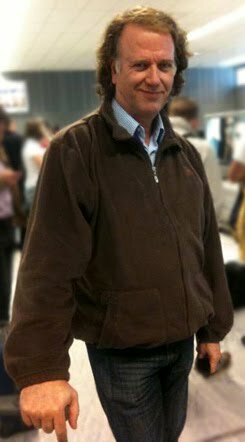 "It is not as big as last year because last year I was crazy, travelling with 500 people and two castles," he said. 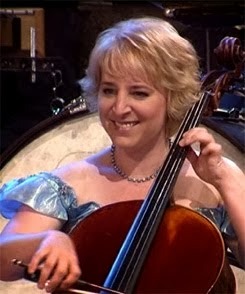 "There are no castles this time, just a backdrop with beautiful lights, beautiful music and lots of waltzes. 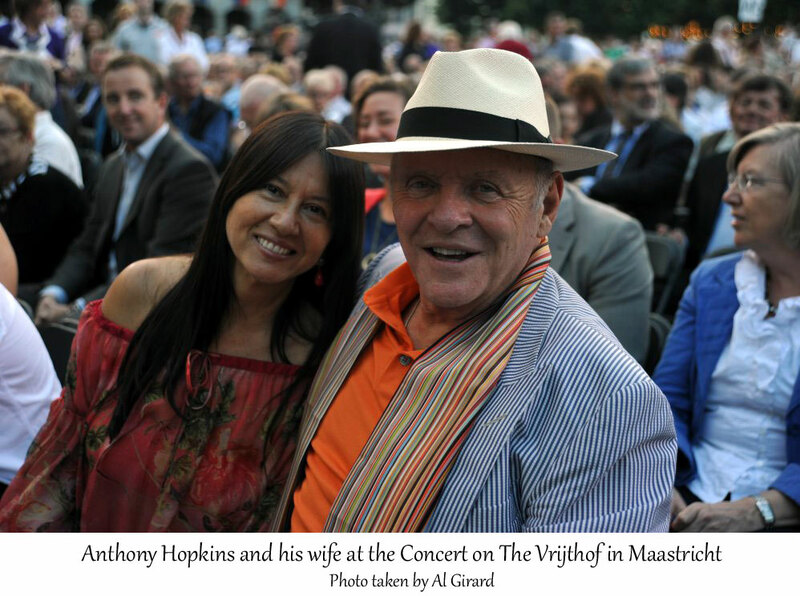 "Waltzing touches my heart, and when I play the waltz it will touch the audience's hearts too." 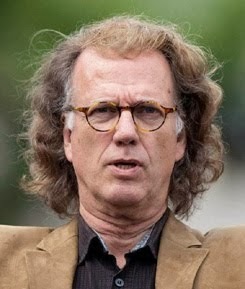 The maestro was moving at more than fast foxtrot speed when he rushed into his hotel yesterday afternoon. Our interview was constrained to 10 minutes. He made straight for the dining room, where he ordered sushi and started conducting with a chopstick and humming along to illustrate his point. 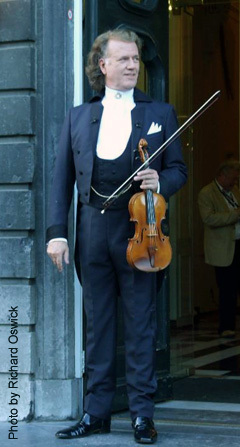 "When you play the waltz in the right way you can see everyone move in the right way," he said. 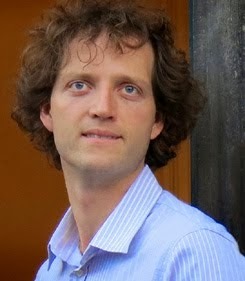 "I play the Danube every night and you can see people move and float, hum and smile. I want to touch their hearts." 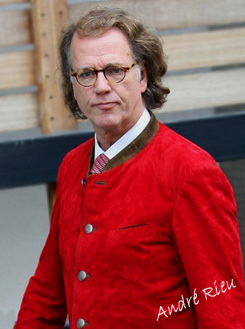 Rieu has been on the road for 30 years. Yet in the first six months of this year he was the fourth top concert earner in the world, after Britney Spears, Madonna and Tina Turner. 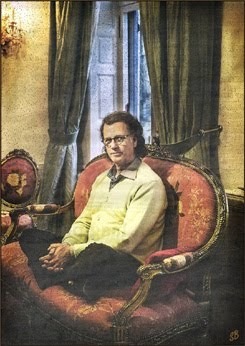 From January to July he had sold 554,242 tickets and taken $57.4 million. His Live in Australia DVD, which followed his tour last year is the fastest-selling music DVD in Australian history. It is only one of his dozens of bestselling DVDs and CDs. But he has no intention of slowing down. 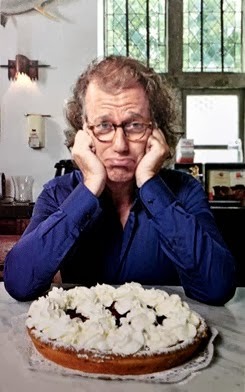 "I've just turned 60 - I am only starting out. I'm going to keep going until I'm 120," he proclaimed. "You laugh - but the scientists are working on it." 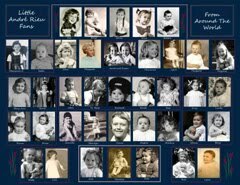 His only regret on this tour is that he missed the births of his new granddaughters. "They promised me they would stay in their mother until I came back home, but they are naughty girls and didn't do that," he said. 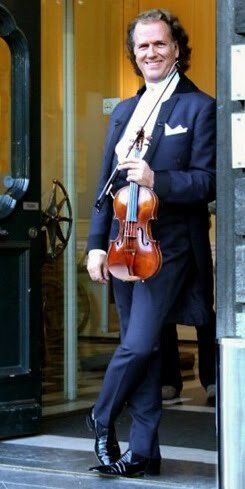 What sort of travelling companion is his Stradivarius? 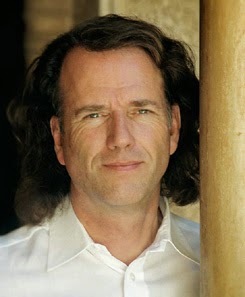 "People often ask me whether I believe it is some kind of human being," he said. "No, I don't believe that. 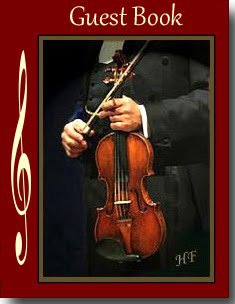 "It's a violin, a piece of wood, but a fantastic piece of wood made by a genius. It has become part of my body, more than a friend." 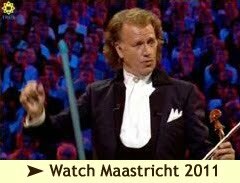 What does the maestro do with people who cough during his concerts? 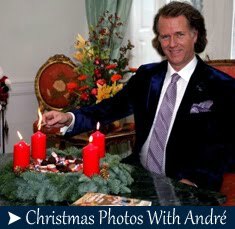 "Nothing," said Andre Rieu, stabbing with his chopstick for emphasis. "Why do people cough at concerts? "Because they are bored. "And in my concerts they are never bored, so they do not cough." 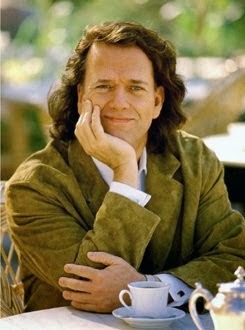 He smiled, ordered the soy sauce in Dutch, applied both chopsticks to the sushi, and the interview was over. 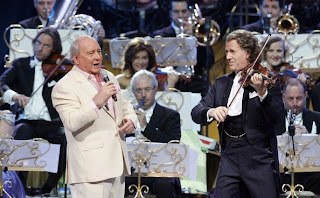 Rieu and his Orchestra, play the first of their four Concerts at Melbourne's Rod Laver Arena tonight. 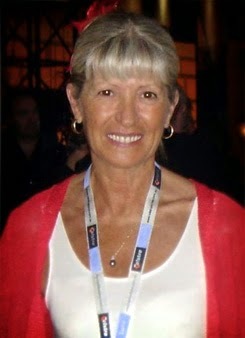 Australia 2008 ~ Were You There? 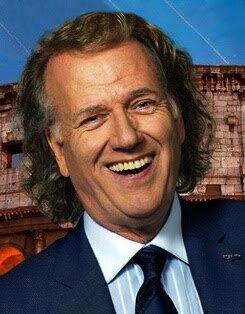 Universal Music: The incredible story of André Rieu's Australian success includes extensive audience and tour footage from his time in Australia, plus selected commentary in the booklet from his fans. 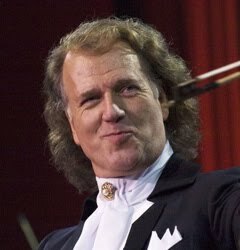 After exploding onto the Australian music charts in 2007, André Rieu's journey into the hearts of Australians was effortless and immediate. 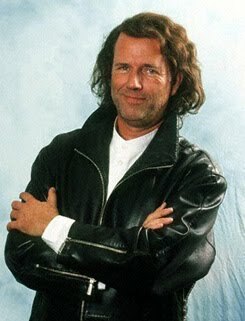 Talk of his DVD's and music quickly overtook the usual dinner table conversation and you didn't need to walk far to see a billboard or poster emblazoned with his cheeky smile. 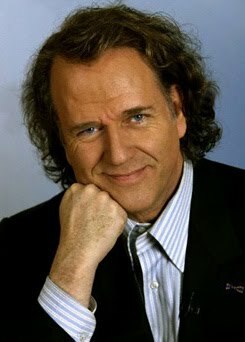 Rieu Mania had well and truly begun. 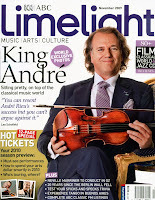 A whirlwind promotional visit in September, 2007 cemented the mutual love this country shares with André and his unconventional take on classical music. 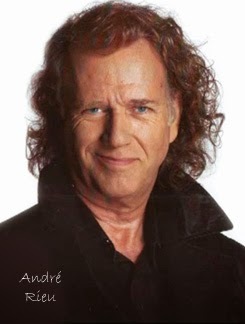 This was quickly followed by the announcement that André would soon bring his spectacular World Stadium Tour, complete with a life size replica of Schoenbrunn Castle down under, sharing this musical passion with his many Australian admirers. Join André on a special behind the scenes journey, from the moment he lands at Melbourne airport, through the entire tour. Witness the backstage fun, a tropical storm, a day at the beach, a cheese sandwich and a tearful farewell. 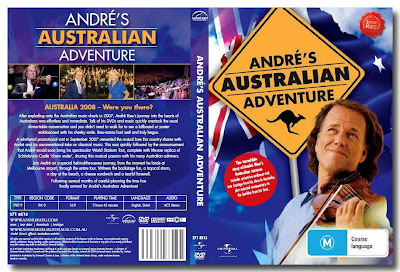 Following several months of careful planning the time has finally arrived for "André's Australian Adventure!" He is a massive global success, playing to full stadiums across the world. 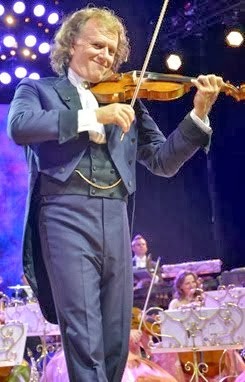 This weekend he performed, along with his very own orchestra, to a sold out audience at Auckland's Vector Arena. 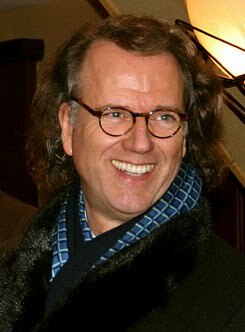 What André Rieu offers is more than a concert, it is a Visual Feast. The logistics are massive and preparation immense, yet it all appears to hum along, the process so finely tuned. 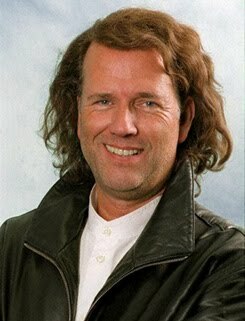 And through it all the Dutchman delivers a night his fans will never forget. 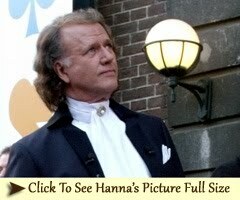 "Close Up's" Hannah Ockelford went back stage to try to unravel the mystery of Andre Rieu. 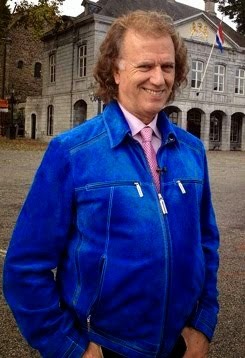 André Rieu Grandfather of Twin Girls from Son Pierre! It's Official!! 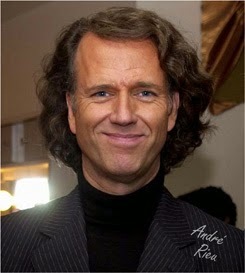 André is Grandfather of Twin Girls, "Linde and Lieke"
Amsterdam ~ Oct. 26, 2009 André Rieu has become a Grandfather for the second time. 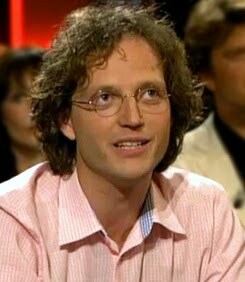 On October 13th, 2009, Pierre son of the violin player became the father of twin girls named Linde and Lieke. 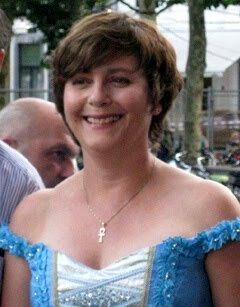 Mother (Eefje) and daughters are doing very well and Pierre is extremely happy. 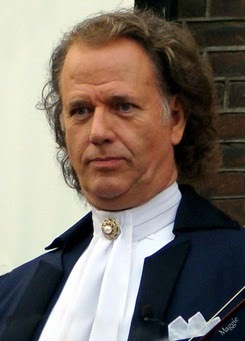 As reported by Shownieuws. 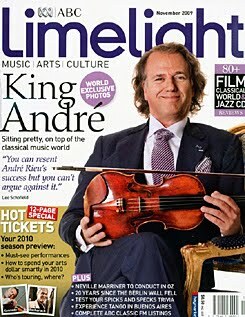 At this moment André is still in Australia for concerts, but has already declared to be very proud and cannot wait until he can see his newborn grandchildren. Until that time he receives photo's and video's. 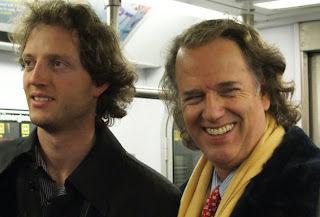 At the end of June André became a grandfather of Ivan, son of his oldest son Marc. 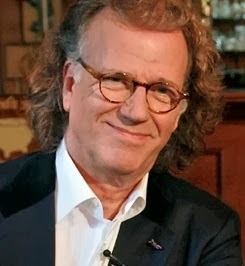 Normally André does not leave his hotel very often, but now he shops frequently and purchases something special for his grandchildren in each town he visits. 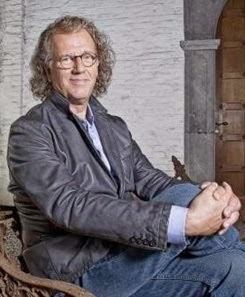 Our Congratulations to Pierre and Eefje on the birth of their little girls, and to the proud Grandparents!! Thanks to Ruud on this SpeedyTranslation for us! Reuben Just Saw His First Two André Concerts in NZ! Click here to read ... ►Reuben's Auckland Report and Lots of Photos! 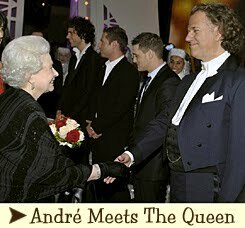 "MELBOURNE AUSTRALIA WELCOMES ANDRÉ HOME"
"The Dame and the Maestro" ~ Dutch violinist is on his way to Melbourne after launching the first of his Australian 2009 concerts in Sydney. 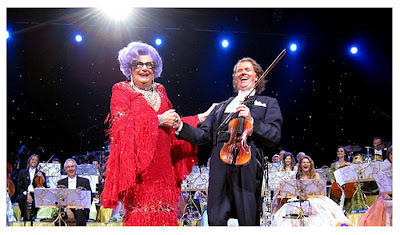 Rieu and his Johann Strauss Orchestra played to a crowd of 14,000 who were thrilled with a surprise appearance by Dame Edna Everage. Sydney radio man Alan Jones who has been battling cancer also made an appearance singing "We Are Australian". The tour included two shows in Sydney, plus performances Sunday and Monday in Newcastle. Other shows are listed for Brisbane, Auckland and Adelaide. The Melbourne concerts will be held at Rod Laver Arena on October 29, 30, 31 and November 1. 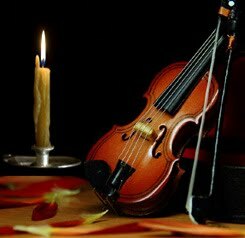 I want to thank you for the wonderful website The Harmony Parlor. 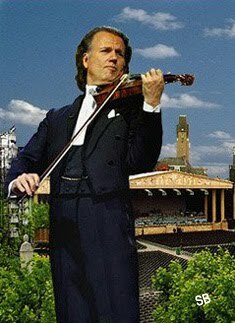 I found the most beautiful pictures of my solo-experience in Kansas City with André and the JSO on the site. I am very gratefull for this! 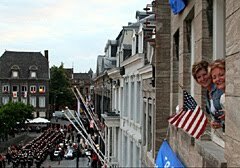 Could you please thank Sonja, Maggie, JH, John and Chris T. for the photos from me. I'm full of joy to have seen it, and I'm very happy the fans were so positive about the performance. Thank you all very, very much! 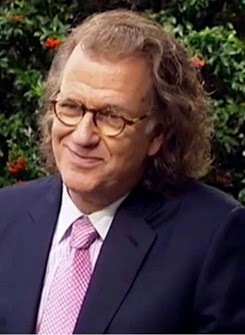 André Rieu Arrives in New Zealand! The King of Waltz Is Here! 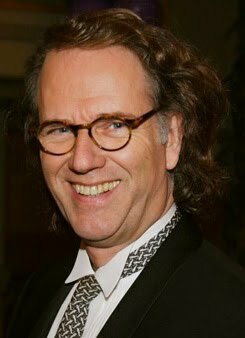 Celebrated musician André Rieu and his orchestra were greeted with a traditional powhiri as they arrived at Auckland Airport this evening. 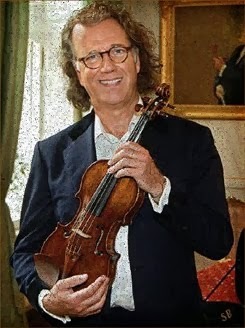 The chart-topping Dutch violinist is kicking off his 2009 Arena Tour with two spectacular shows at the Vector Arena this weekend. 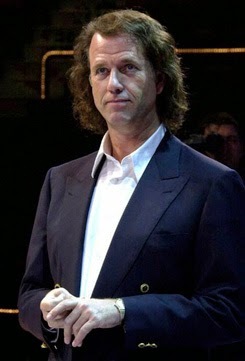 Rieu, best known for creating an international revival in waltz music, has sold more than 25 million albums worldwide. 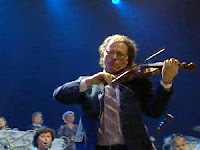 His 2008 Australian Tour broke classical concert records and he has sold more than 200,000 DVDs in New Zealand. 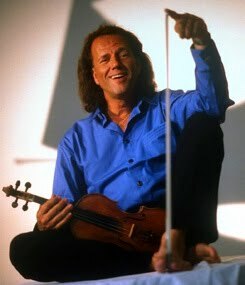 Rieu's six CD box set "The 100 Most Beautiful Melodies" recently peaked at number five in the New Zealand Album Chart. 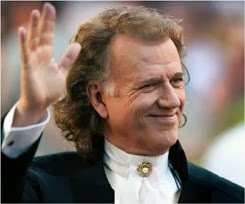 André Rieu returned to the Australian stage last week with a jubilant '30th Anniversary Tour' concert at ACER Arena in Sydney. 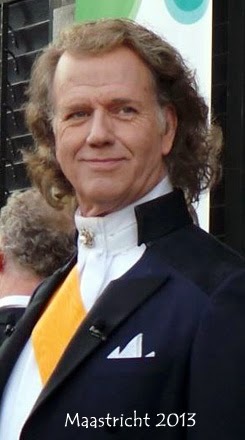 Celebrating 30 years of performing, Rieu, his soloists and The Johann Strauss Orchestra wowed with a collection of songs including waltz by Frans Lehr, the Spanish 'Espaa Cani' and a traditional Dutch 'Klompendans' (clog dance). 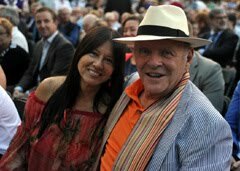 They were also joined by some very special guests, including a stirring spoken and sung rendition of 'We Are Australian' by radio personality Alan Jones, resulting in a standing ovation from the 15,000 audience members. 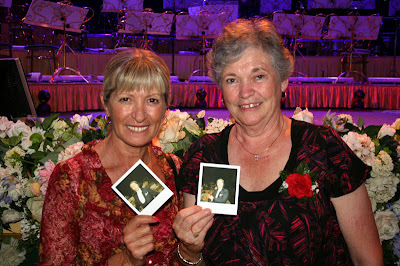 The concert ended with a surprise visit from Australia's First Lady, Dame Edna Everage. 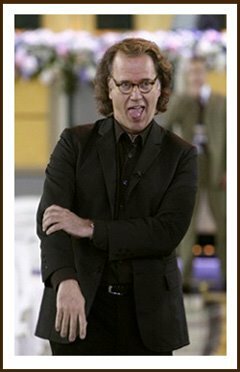 To much laughter and applause Dame Edna announced, that she was engaged to be married to Rieu, stating after that "many of the female members of the audience now want to scratch my eyes out". 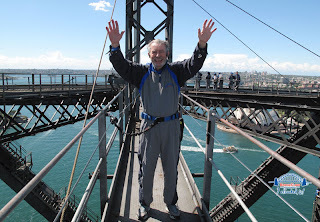 Jim Morgan Conquers The Sydney Harbor Bridge! 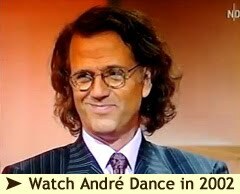 We see a lot of reviews of André's Concerts referring to his Audiences as, the "Senior" group, the "60 and Older Group", the "Geriatric Group" and oh yes, my favorite ~ the "Blue Rinse" group! They say it as if they were all a bad thing. Well here's to show that we may not be "Twenty Something's" any more, or even Thirty Something's, but that does not mean we're sitting at home knitting, or sitting on the couch watching Game Shows. 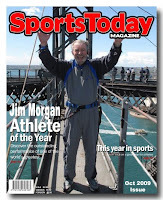 We won't tell Jim's age ... but he's not "Thirty Something!!" 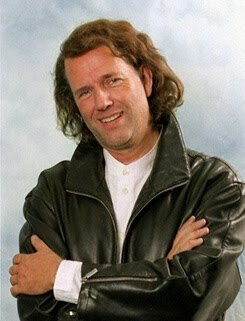 Good for you Jim!! 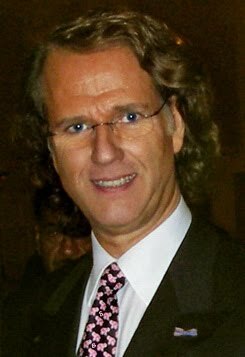 Love Him or Hate Him, André Rieu Can Not Be Ignored ~ Whether you like his music or not, it's impossible not to notice the impact Rieu has had on the global music scene, but particularly in Australia. The numbers speak for themselves really. 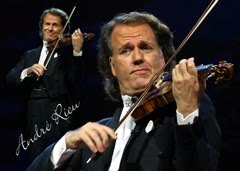 Rieu sold out all his concerts last year and has sold tens of thousands of CDs and DVDs. 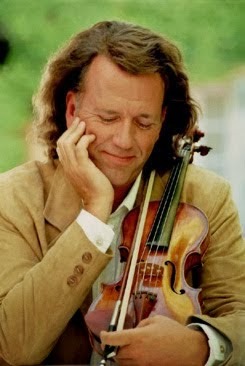 The monthly classical ARIA charts have not been without a Rieu release since 2007. Click on link below to read the full article with all the photos. Thanks Jann for another great team effort. 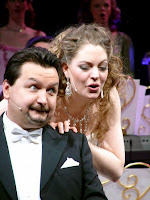 THE entertainment spokes of a close knit hub of young Redland entertainers is spreading on to the world stage, according to Birkdale soprano Mirusia Louwerse. Mirusia was spending some time at home before starting an Australia/New Zealand tour with the internationally renowned violinist Andre Rieu. While here, she had a small soiree inviting along her former agent Alan Beard of Birkdale, Adam Lopez of Ormiston, Jaimie Wells of Wellington Point, Rachael and Rebecca Jackson of Victoria Point and Ben and David Mibus of Cleveland. 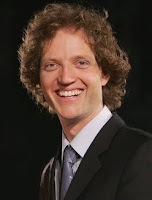 “There is so much talent here and lots of local support. There’s no jealousy here. I have been happy to be home and give advice and work together with these artists. It’s nice to think we can help each other. It’s taking Redlands out to the world,” Mirusia said. 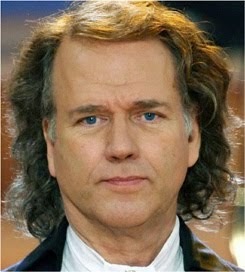 Mirusia said it was her way of repaying similar support for her work in Australia before joining the Andre Rieu team. “It’s about promoting yourself and getting your face out there. I was doing all right here with Scotland the Brave. Singing is all I have. 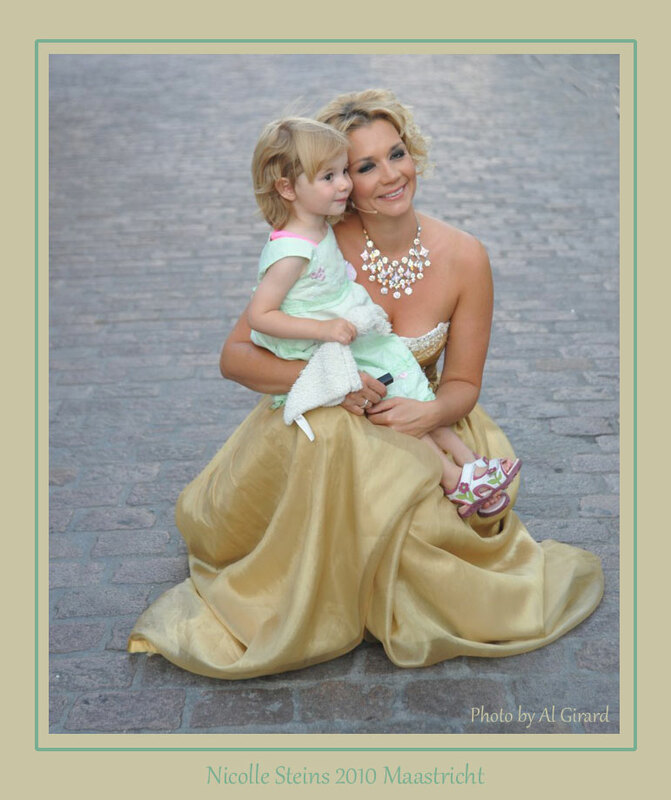 It’s my whole life and that’s why I put so much work into it,” she said. 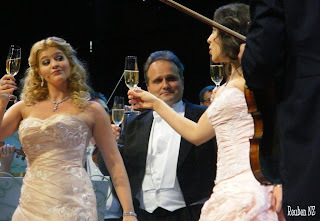 Mirusia joins the Andre Rieu tour which takes in Sydney, Newcastle, Brisbane, Auckland, Adelaide and Melbourne. There are performances in Brisbane at the Entertainment Centre on Wednesday, October 21 and Thursday, October 22. “I came in at the right time. I’ve been part of the big explosion over here. 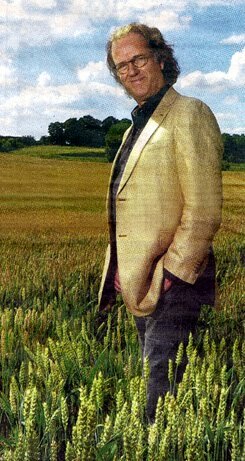 I joined about the time his CDs and DVDs started being promoted to the Australian public,” she said. “It’s a busy life but I love it so much. Skype and MSN makes it easy to keep in touch with my friends and my parents. It’s a lot easier to say ‘Hello’ and to check everything is okay,” she said. Mirusia leaves Australia later this year to tour France and give Christmas concerts in Belgium, Germany and Holland. Breakfast at Lena's at Warners Bay was a wonderful experience. At 8.00am, thirteen of us enjoyed each other's company while André (Pat's cutout) watched on. 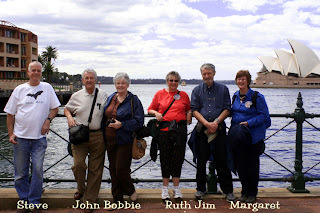 Bobbie, John, Ruth and Jim from United States were welcomed, as were Shirley, Norm, Ellen and Ivan from Sydney. 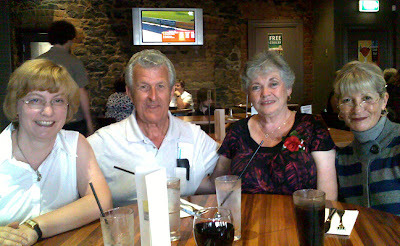 Maree, George, Pat, Faye, Peter now called Father Superior and myself were also there. We were looked after by Lawrence and Caroline, the owners of Lena's. We were in the alcove so we could do whatever we wanted, and Lawrence kindly played a CD and we even managed a waltz or two !!! Naturally the topic of conversation was the previous concerts and how they compared between Sydney and Newcastle. We had a yummy breakfast choosing juices, variations on Bacon and eggs etc followed by coffee. We were there for so long that Pat had pikelets for morning tea. We all watched on. I don't know how she does it. We then had a group photo taken with André, Lawrence and Caroline. Again it was great to see the Friendships and fun that was had by all. After leaving Lena's, we took "André" across the road to the Esplanade where we had another group photo with beautiful Lake Macquarie in the backgroud and then went our separate ways. Ticketek have just advised Presale Tickets for concerts next year - Sydney, Newcastle & Brisbane. Adelaide and Melbourne presales will be announced closer to concert dates in those cities. 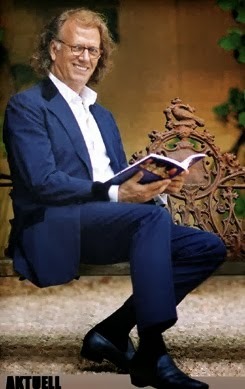 ALSO The new DVD/CD - "Live in Sydney 2009" - is due for release on 11 December (2009)!! Thanks to Mike C. in Australia for the "heads up" on these!! Today was another super day. Had some rain this morning but the skies cleared to another beautiful day with plenty of sunshine. The Newcastle fan luncheon was a complete success. After the luncheon we all walked over to the venue and mingled with the attendees, and met more fans. Tomorrow will be concert number 2. We first have a breakfast meeting in the morning, we'll do some sight seeing and then get ready for yet another wonderfuil concert. 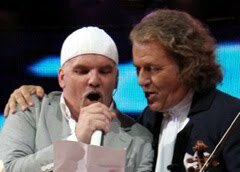 October 17, 2009 The Herald Sun ~ ONE is the Queen of Australian entertainment, the other a Music Maestro. 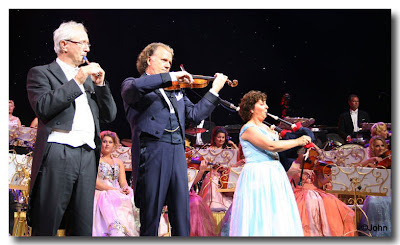 And on Thursday night they joined forces to the delight of 14,000 screaming fans as Dame Edna Everage took to the stage of Sydney's Acer Arena, upstaging internationally acclaimed violinist Andre Rieu. 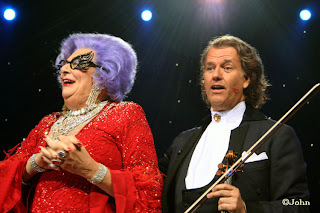 Dame Edna wowed the audience, performing the theme song from Neighbours in honour of Rieu's appearance on the popular Australian soap earlier this year. Having paid up to $289 for platinum seating, the crowd were expecting a good night out and certainly got it. 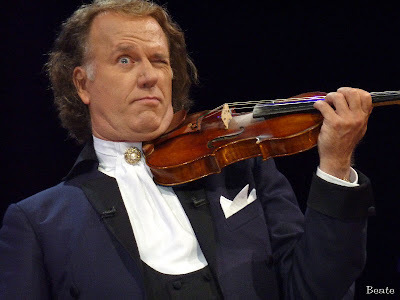 The Waltzing Maestro is set to wow Melbourne audiences when he takes to the stage at Rod Laver Arena from October 29th to the 1st of November. Thanks to Robyn. Great shot John!! 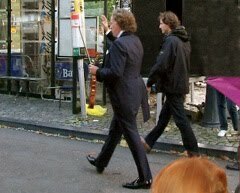 A Note from John With More Pictures!! I just have to say that the concert last night was just out of this world! Dame Edna was a riot. We laughed sooo hard! 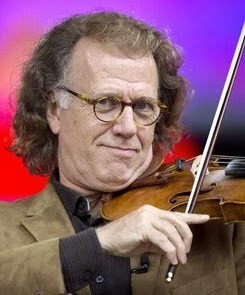 And his grandson is a fantastic violin player. Today we all went to Manly Bay, had fish and chips on the beach, and Bobbie was presented with a lovely Birthday cake, on the beach. We all sang "Happy Birthday" to her. This is the video from the 'Today Show' in Sydney with Richard Wilkins interviewing André, Alan Jones and Dame Edna at the concert in Sydney last night. Thank You to Mike C. in Australia for sending it to us! From Kate Hunt in Sydney ~ The concert was the best I have been to. 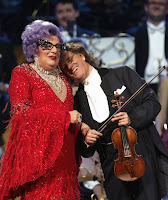 The Dame Edna episode was really, really funny! 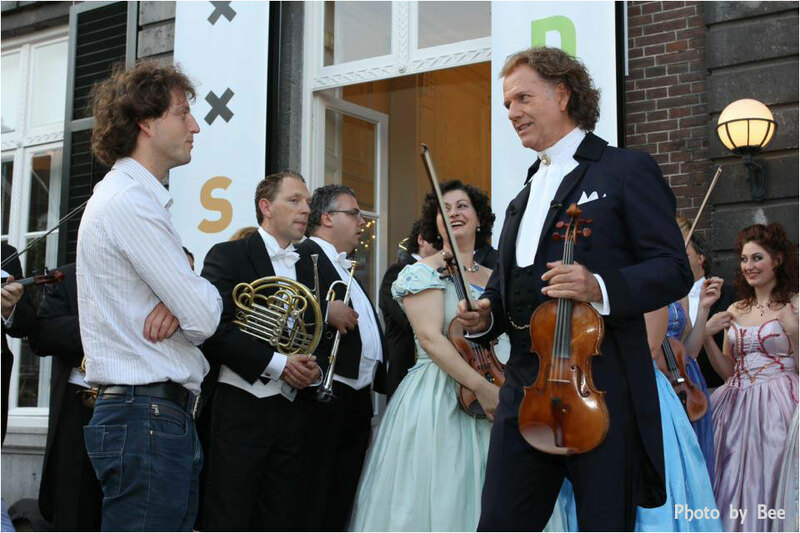 The orchestra members were doubled up and André was beside himself with laughter. The mosh pit was wild. 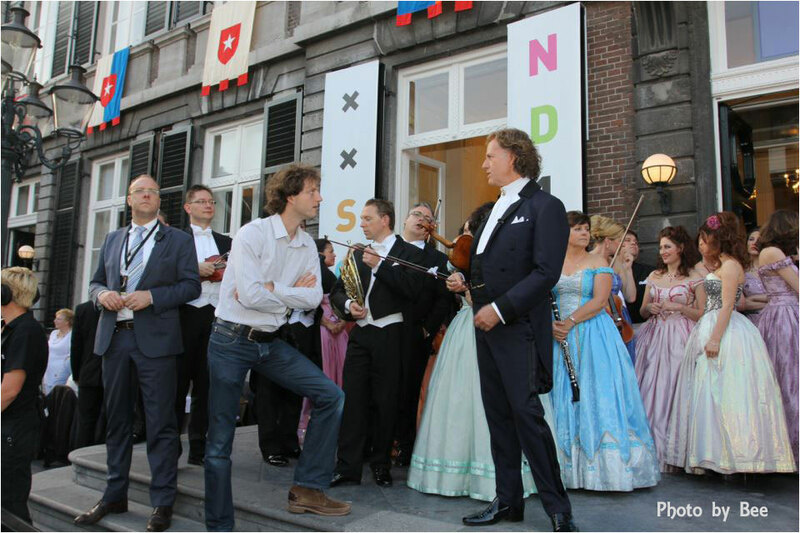 They had to get Johan to pull a woman off the flowers at the front of the stage! ~Thanks to Kate for sending this!! 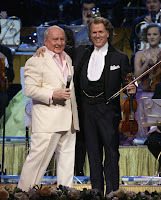 He is Sydney's biggest radio show host but Alan Jones last night put his singing voice to the test joining violinist André Rieu on stage to belt out an iconic Australian tune. Jones, who has battled illness for the past few months performed We Are Australian in a mixture of song and spoken words at the Acer Arena Concert in Homebush last night. 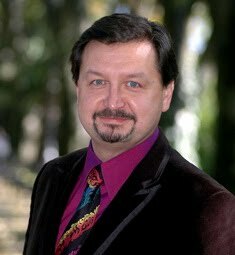 Dressed in a cream suit with an open neck pink shirt, and with a folded pink silk handkerchief in his pocket, and looking better than he has for some time, he was warmly received by his radio audience made manifest in the flesh. They joined in the chorus with gusto and listened respectfully during the verses. 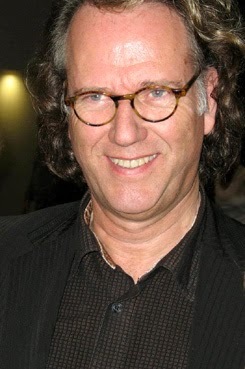 With a John Travolta like pointed finger, Jones pointed out the Australians in the audience. 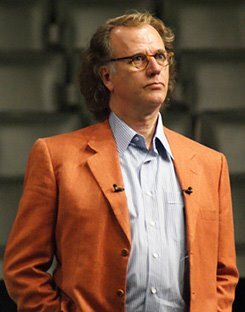 Only slightly ragged in the closing verses, he acquitted himself well with a roar of appreciation and a standing ovation from the audience as they called out for more! He obliged by giving them another chorus of the song. 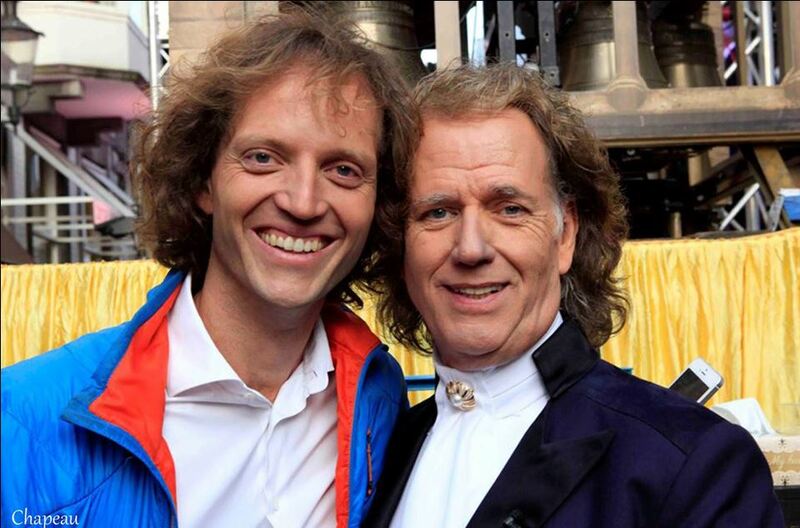 Rieu and Jones hugged before Jones left the stage, with Rieu shouting out "Aussie, Aussie, Aussie," to which to audience responded with a hearty "Oi oi oi". 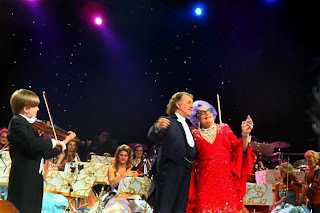 Dame Edna Everage also wowed the audience, performing the theme song from Neighbours, in honour of Rieu's appearance on the popular Australian soap earlier this year. ~ by Maureen Shelley. 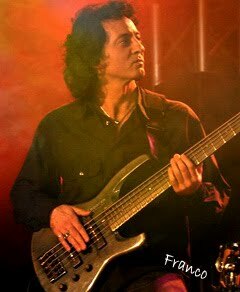 Thanks to Jann for sending this!! As you know John and Bobbie are in Australia now. When John can get computer access he will send pictures to me so we can follow their travels and concerts. 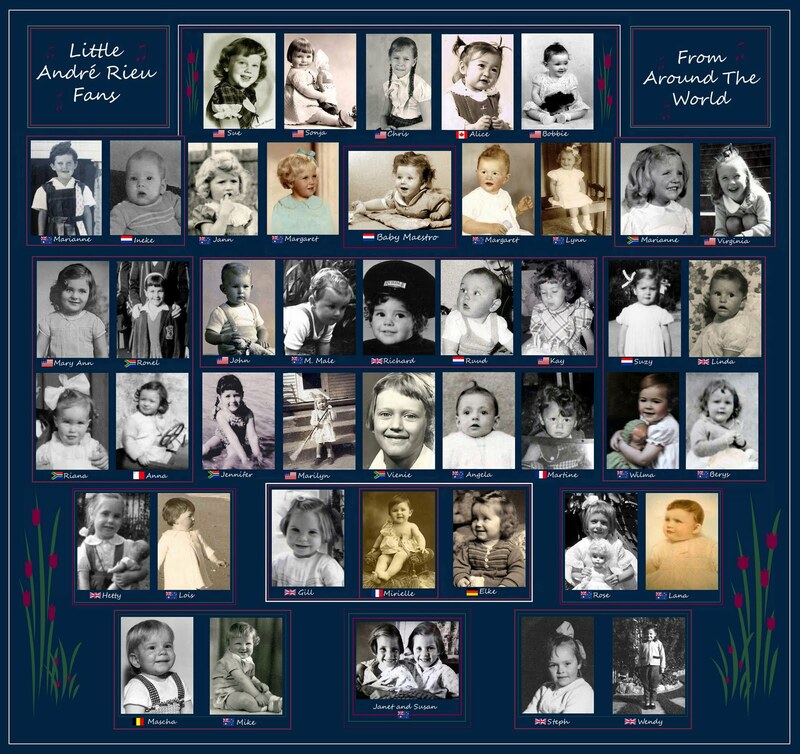 Here's a few to start on their first day with Jim, Ruth, Margaret, Faye and Vilma. André sure does brings friends together across the miles!! 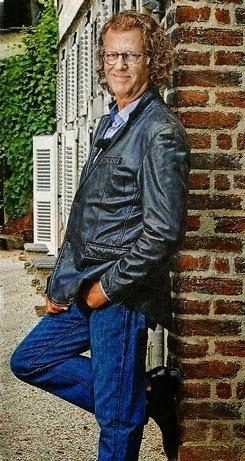 I have created a page for him and will update his pictures as they come in and post it on here.